Oracle triggers are a handy but often misused function of the Oracle database. Learn all about them in this article. A trigger is a piece of PL/SQL code on your database that runs when certain events happen. It’s like a stored procedure, but you can’t explicitly call the trigger. It can only run when the event that the trigger is linked to is run. Triggers can be enabled and disabled. When they are enabled, the database will automatically run it when the triggering event occurs. If it is disabled, it does not run. Within each of these categories, there are several types of triggers. The main type of trigger that I’ve seen used is the DML trigger. They are called that because they run when a DML statement is executed (INSERT, UPDATE, or DELETE). The triggers can run either BEFORE the statement is executed on the database, or AFTER the statement is executed. Because of this, these triggers are often named or referred to as “when they run” and “what statement they run on”. I’ll go into detail on each of these triggers later in this article. You can click on the links to be taken to the place in this article where I detail the triggers. Schema triggers, or DDL triggers, are triggers that fire on events that happen on any object within the schema. It fires when the user who owns the schema is the current user, and they initiate the triggering event. I’ll also go into more detail on these triggers in the Schema Triggers section later in this article. A database trigger is created on the database, and it is run whenever the event the trigger is linked to occurs. This happens no matter which user is logged on to the database. I’ll go into more details on these Oracle triggers in the Database Trigger section of this article. 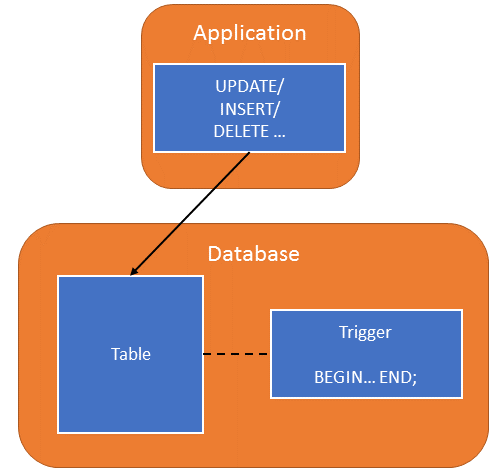 If you’re looking for information on SQL Server triggers, read Vivek Johari’s article on an introduction to triggers. So, we now know what a trigger is. It’s a piece of code that runs at certain events. Why would you want to use a trigger? The code that goes on a trigger will run on the event that triggers it. This means you don’t need to make sure that applications call stored procedures to perform the functionality you want. Any time a specific action is performed, the trigger will fire. Let’s take a look at how to create a DML trigger. To create a trigger, you use the CREATE TRIGGER statement. The details of the statement will change depending on if you’re creating a DML trigger, a schema trigger, or a database trigger. OR REPLACE: An optional clause. If you specify this, it means the trigger with the same name is replaced with this trigger. It allows you to change the trigger without having to drop the trigger using the DROP TRIGGER statement. trigger_name: The name of the trigger in the database. BEFORE|AFTER: Specifies if you want the trigger to run before the statement or after the statement. dml_event: The DML event that the trigger runs on, which could be INSERT, UPDATE, or DELETE. table_name: The name of the table that the event runs on. FOR EACH ROW: This means that the trigger runs for each row affected by the statement. If this is omitted, the trigger is run once. DECLARE: This section allows you to declare variables to use within the trigger. pl_sql_code: This is the body of your trigger and is where you put the code that defines what you want to do. EXCEPTION exception_code: This is the Exception section and it’s where you put your error handling, if you have any. The trigger name must be unique when compared to other triggers in the same schema. The names don’t need to be unique when compared to other objects (e.g. tables or procedures), but it is recommended to give them unique names within the schema for all objects (e.g. avoid naming a trigger the same as a procedure). Let’s take a look at each of the DML triggers and see some examples of them. This data can be referenced using two variables called :NEW and :OLD. The :NEW and :OLD data mean two different things, depending on which statement is run. How do you refer to a particular column value? You add a period, then the column name. Further to the table above, you can only read and update these values in certain situations (either statement level or row level). This table outlines when you can and can’t read or update these values. Refer to the examples below for each trigger type for some examples of these in the triggers. A BEFORE INSERT trigger is a trigger that runs before an INSERT statement is executed. You can’t create a BEFORE INSERT trigger on a view, unless it is an editioning view. If you’re running a statement trigger (by omitting the FOR EACH ROW clause), you can’t read the :NEW or :OLD variables. You can’t read or update the :OLD values, as they don’t exist for an INSERT trigger. This trigger is designed to set the created_date and created_by columns for the records that are inserted. The FOR EACH ROW is specified so that the code runs for each row that is inserted. The current username is retrieved from the USER function. Then, the created_by column in the NEW record is set to this username. Also, the created_date is set to today’s date and time. This is a simple and common way to use a trigger. It ensures that the created_date and created_by values are set at the database level, which results in a more accurate method of logging this audit data. Also, a common way to use the BEFORE INSERT trigger is to create an auto increment column. In Oracle 12c, the feature was added to define a column as auto increment. But, if you’re on 11g or earlier, then you need to use a BEFORE INSERT trigger. For more information, read this guide on creating an AUTO INCREMENT column in Oracle. It gets the nextval of a sequence, and stores it into the primary key of the table. The AFTER INSERT trigger is a trigger that runs after an INSERT statement is executed. You can’t create a AFTER INSERT trigger on a view, unless it is an editioning view. This is a simple trigger that runs at the statement level, because I omitted the FOR EACH ROW clause. Each time an insert statement is run on the employee table, this code is run. It inserts a row into the statement_log table, with details about the current user, current date and time, the type of statement that was run, and the name of the table. Note that because this is a statement trigger, I can’t use the :NEW values. This is because :NEW refers to a single record (e.g. :NEW.first_name, :NEW.salary), and if there are multiple records inserted, we can’t tell which record the :NEW would refer to. A BEFORE UPDATE trigger is a trigger that runs before an UPDATE statement is executed. You can’t create a BEFORE UPDATE trigger on a view, unless it is an editioning view. If you’re running a row trigger (using FOR EACH ROW), you can read and update the :NEW and :OLD values. This trigger runs before the employee table is updated. It sets the updated_by value to the current user, and the updated_date value to today’s date. This is a good way of ensuring the correct data is captured in these two columns. An AFTER UPDATE trigger is a trigger that runs after an UPDATE statement is executed. You can’t create a AFTER UPDATE trigger on a view, unless it is an editioning view. If you’re running a row trigger (using FOR EACH ROW), you can read but not update the :NEW and :OLD values. This example inserts the data before the update of the employee table into an employee_audit table. It makes use of the :OLD variable to get the data before the update, and capture who performed the updated and at what time. When you run an UPDATE statement, you specify which columns you want to update. You can define a trigger on the UPDATE statement to only run if a specific column is updated. If the triggering statement includes one of these columns in it, then the trigger is run. If the column is not in the list of columns in the trigger, the trigger is not run. Assume we have this statement to run on our table. SET email_address = "[email protected]"
We could have a trigger that checks if the email address is also a customer’s email address, and set a flag if it is. We would only want to run this when the email address is updated. Notice on the second line: “BEFORE UPDATE OF email_address ON employee”. We specify “UPDATE OF email_address” to ensure that this trigger is only run when the email_address is run. The trigger then performs a SELECT statement into a variable, and depending on the result of this variable, it sets a different value for a column. If we wanted to specify multiple columns, we could separate them by commas. You can’t specify columns with UPDATE statements with INSTEAD OF triggers. If you specify an object column, the trigger is fired if any of the object column attributes are modified. The BEFORE DELETE trigger is a trigger that runs before a DELETE statement is executed. You can’t create a BEFORE DELETE trigger on a view, unless it is an editioning view. If you’re running a statement trigger (by omitting the FOR EACH ROW clause), you can’t read the :OLD values. If you’re running a row trigger (using FOR EACH ROW), you can read and update the :OLD values. This trigger will insert a record into the delete_log table before each delete statement is run. It stores the table name, the user who ran the statement, and the current date and time. The AFTER DELETE trigger is a trigger that runs before a DELETE statement is executed. You can’t create a AFTER DELETE trigger on a view, unless it is an editioning view. If you’re running a row trigger (using FOR EACH ROW), you can read but not update the :OLD values. This trigger inserts a record into the employee_audit table for each record deleted from the employee table. It stores all of the data from the deleted record, as well as who deleted it and what day and time they deleted it. You can define a trigger that handles multiple events (INSERT/UPDATE/DELETE) on a single table. This is done by using the OR keyword. You can define two or three of INSERT, UPDATE, or DELETE when creating the trigger. This will mean the trigger will run when either of those statements are executed. One thing to be aware of is that the rules for :NEW and :OLD still apply. So, if you have a trigger that runs on INSERT and UPDATE statements, and you refer to the :OLD values, you need to be careful where you reference it. You can use the keywords INSERTING, UPDATING, or DELETING to determine what kind of statement was run. This is often done with a CASE statement. INSERTING is when an INSERT statement is run or when an INSERT part of a MERGE statement is run. UPDATING is when an UPDATE statement is run or when an UPDATE part of a MERGE statement is run. DELETING is when a DELETE statement is run, but not when a DELETE part of a MERGE statement is run. A schema trigger is a trigger that is fired on a particular event on any object in the schema. It fires when the user who owns the schema is the current user, and they initiate the triggering event. Schema triggers can be created on DDL events or on database events. Refer to the table below to see which events are valid. The main difference between the syntax for these triggers and the DML triggers is the “ON SCHEMA” keyword, and the actual trigger events used. Examples of each of the events would look very similar, so I’ll show you one example using a schema trigger. If you wanted to create a trigger that fired on multiple events, you can use the OR keyword between each event. Here is an example of a trigger that fires on a GRANT or REVOKE event. There are a range of commands and functions you can use when working with system events, such as getting the list of grantees. These are detailed in this Oracle page. A database trigger is created on the database, and it is run whenever a database specific event occurs. This happens no matter which user is logged on to the database. You can create database triggers on the DDL events mentioned in the DDL and Database Events section. This means that the trigger will fire for all users who perform the event, not just if the current user owns the schema. Refer to the table below to see which events are valid. This might not be the best use of a logon trigger, but it’s just showing the concept of a database-level trigger for the logon event. Both schema and database triggers can be triggered on DDL and database events. A DDL event occurs when a DDL statement is run, and a database event occurs when specific things happen on the database. An INSTEAD OF trigger is a trigger that is defined to run instead of a particular DML statement, or a system trigger defined on the CREATE statement. The INSTEAD OF DML trigger is run by the database instead of the actual command it is based on. It can read :OLD and :NEW values, but can’t change them. INSTEAD OF triggers can be dangerous and can hurt the design of your database if they are used inappropriately or too often. One way to use INSTEAD OF triggers is to update a view that cannot be updated. This view is not updateable because the primary key of the employee table (employee_id) is not unique in this view. If a user tries to INSERT into this view, they will get an error. However, we could create an INSTEAD OF trigger on the INSERT statement to say “instead of inserting into the view, we will insert into the underlying tables”. This trigger will fire whenever an INSERT statement on the department_employee_info table is performed. Instead of performing the INSERT, this code will run. It inserts data into the employee and department tables. When the user queries the department_employee_info view again, they should see their data. The other type of INSTEAD OF trigger is the INSTEAD OF CREATE trigger. This is a system trigger that is defined on the CREATE statement. It runs on the database instead of the CREATE statement being run. These are useful Oracle triggers because they allow you to combine the functionality into a single trigger, which allows for variables to be shared if necessary, and for a cleaner solution. You can combine multiple trigger events into this compound table as well. So, you can use the INSERTING/UPDATING/DELETING checks in each of the sections in this syntax to further define your trigger. Drop and recreate the trigger. Create the new trigger using the CREATE OR REPLACE keywords. There is an ALTER TRIGGER statement, but that is only used for recompiling, enabling, or disabling triggers, as I’ll cover later in this article. Like many other database objects, triggers can be removed. This is done by dropping the trigger using the DROP TRIGGER statement. This will drop the employee_bef_insert trigger. The trigger must be in your schema. You must have the DROP ANY TRIGGER system privilege. To drop a trigger in another user’s schema, you must also have the ADMINISTER DATABASE TRIGGER privilege. Triggers can be enabled or disabled. As mentioned earlier, a trigger can only be executed if it is enabled. Triggers are enabled by default. To disable a trigger, you use the ALTER TRIGGER command. If a trigger is disabled, it is not executed when the linked statement is executed. Triggers can be renamed using the ALTER TRIGGER command. When you rename a trigger, the database rebuilds the remembered source of the trigger in the views USER_SOURCE, ALL_SOURCE, and DBA_SOURCE. Comments and formatting may change in the TEXT column of those views. There is some debate in the development community over whether triggers are useful, dangerous, or even necessary. Avoid using triggers on the database if you can help it. Adding DML triggers to tables will impact performance. Putting non-transactional tasks inside triggers can cause problems. Non-transactional work may include emails or job creation. Don’t create a chain of triggers. This can lead to messy solutions and can be hard to debug. Toon Koppelaars has a blog that discusses when triggers can be used, which has some great information. You need to have the ADMINISTER DATABASE TRIGGER privilege. One error you might get when working with triggers is called the “mutating table” error, or ORA-04091. You’ve written a trigger on a table. The trigger is on a row-level event. Within this trigger code, you reference the table that the trigger is based on. There are several solutions to this, some good and some bad. I will detail this in a separate article. So, there’s my guide on Oracle triggers. If you have any questions, leave them in the comments section below. Lastly, if you enjoy the information and career advice I’ve been providing, sign up to my newsletter to stay up-to-date on my articles. You’ll also receive a fantastic bonus. Thanks!